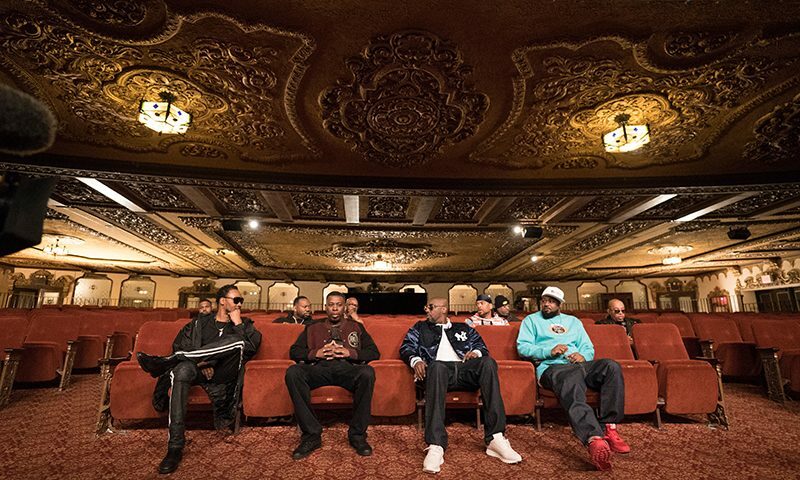 A still from Wu-Tang Clan: Of Mics and Men by Sacha Jenkins, an official selection of the Indie Episodic program at the 2019 Sundance Film Festival. Courtesy of Sundance Institute | photo by Sue Kwon. All photos are copyrighted and may be used by press only for the purpose of news or editorial coverage of Sundance Institute programs. Photos must be accompanied by a credit to the photographer and/or 'Courtesy of Sundance Institute.' Unauthorized use, alteration, reproduction or sale of logos and/or photos is strictly prohibited. 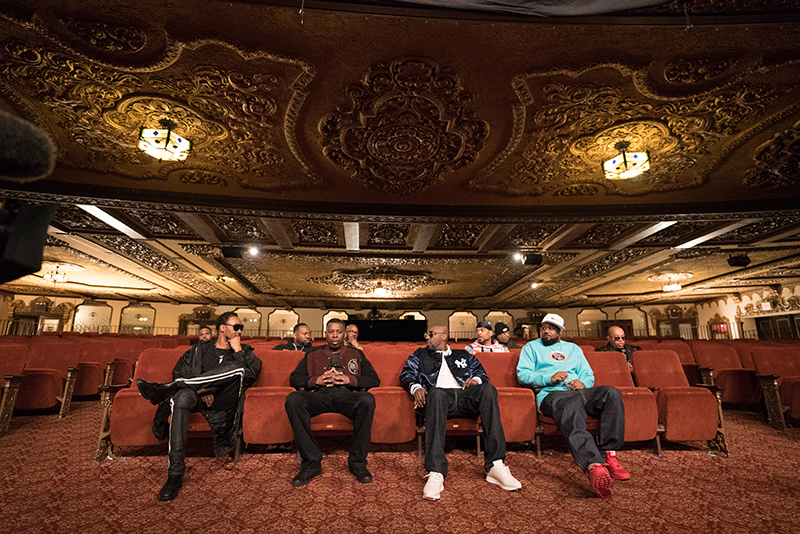 Gathered in a pristine theater in Staten Island, members of renowned rap group Wu-Tang Clan reminisce on their origins and the circumstances that brought them into fame. It was the first two parts of a four-part Showtime series, exposing the racism, violence and drugs surrounding each member since a young age and how this led to the formation of Wu-Tang Clan. With the metaphor of the hood being like a prison—i.e. you weren’t free to just go anywhere while the police were constantly dropping in, it was easy to see how big names like RZA, Ghostface Killah, and Method Man felt the need to band together and pour everything they had into their music as a means to escape the volatile situation around them. Wu-Tang Clan came out of obscurity to mass appeal with each member possessing a raw talent that fed off one another. There was also an element of a D.I.Y hustle that helped them get their first exposure to audiences outside of Staten Island. Former manager Mook strategically moved records the same way he would try to move “product” in his former life as a crack dealer, as he had no previous experience in the music industry. In one story, he talks about sending people into a record store to ask for the Wu-Tang Clan “Protect Ya Neck” single after the woman running the store had initially refused to buy it from him. In another, a bunch of members of the Wu-Tang clan showed up at The Stretch and Bobbito Show, pressuring Bobbito Garcia to play “Protect Ya Neck”, (Bobbito was instantly a fan). One thing that impressed me about the documentary was RZA explaining the meaning behind the different elements of Wu-Tang, and everything had a specialized meaning that elevated Wu-Tang’s purpose. The namesake of Wu-Tang was taken from the kung-fu film Shaolin and Wu Tang, which stressed the Wu Tang as having incredible swordsmanship. For RZA, the metaphor behind Wu-Tang is that the tongue is the sword, and Wu-Tang Clan was bringing all the best MC’s in the game together. Even the concept behind “C.R.E.A.M.” came from a letter of a friend who was in jail for drug possession, describing the sad reality of his life as being ruled by money. RZA is hailed as not only the producer for the Wu-Tang clan but also it’s chief strategist. For him, bringing together Raekwon and Inspectah Deck‘s melancholic verses with Method Man’s hook was the right combination to make “C.R.E.A.M.” their most recognizable song.